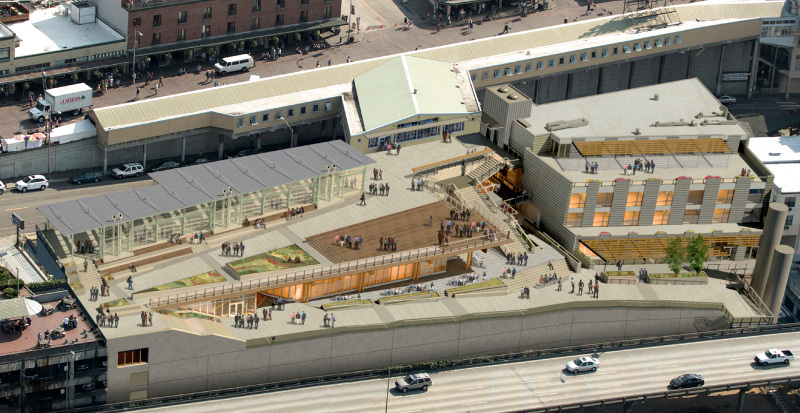 In June, 2017, a new extension to Pike Place Market called MarketFront opened. It compares with the Market’s last extension in 2005, the LaSalle Annex. The new structure is equally spectacular in size and function. This new $74 million waterfront entrance to the Market welcomes Seattleites and visitors to active commercial spaces, sheltered farmer and crafts tables, and multiple public art installations. It offers 40 new dwelling units for low-income seniors and artists, as well as 300 underground parking spaces for visitors. MarketFront offers several plazas with expansive views of Puget Sound and the Olympic Mountains as well as spaces for social services and community meetings. A new brewery, fish cannery, and chocolatier are now in production along with more music from street buskers. The impending, but changing, date for the demolition and removal of the Alaskan Way Viaduct, after sixty-one years and three earthquakes, was the impetus for the planning, funding and construction of MarketFront. 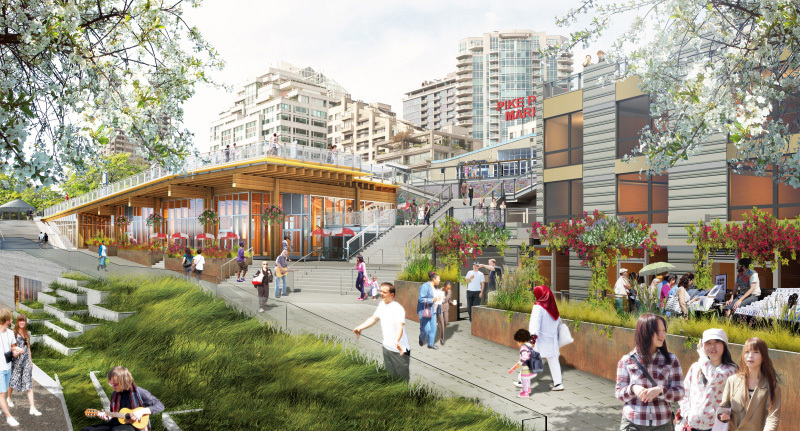 The Pike Place Market Preservation and Development Authority led the project, with capital fundraising help from the Market Foundation. City and state parking mitigation funds, plus federal financial resources from New Market Tax and Low Income Housing credits were also essential contributors. The Market’s expansion fits in with the new sea wall (due for completion in 2020) and the Central Waterfront Redevelopment project. These projects when finalized will provide one long sweep up from the water to the original wonderland of the 100+ year old Pike Place Market. During the Market’s long history, it has often been in conflict with well-intentioned threats from civic improvement schemes, World War II internment of Japanese-Americans, and its decaying building stock. It has weathered three major earthquakes, political attacks, zealous developers, and all manner of controversy, yet at each challenge, people of the Market, individually and as a community, have come forward to defend, save, rehabilitate or renovate, always upholding the original values of the Market. The Market continues to offer the day-shopper fish, fruits and flowers. Visitors delight in an array of pleasure from artistic visual displays of produce to the aromatic delights of baking bread, bar-b-que and pickles.